Microsoft has acknowledged the problem. “We’re working to restore product activations for the limited number of affected Windows 10 Pro customers,” Jeff Jones, a senior director at Microsoft, said in a statement. 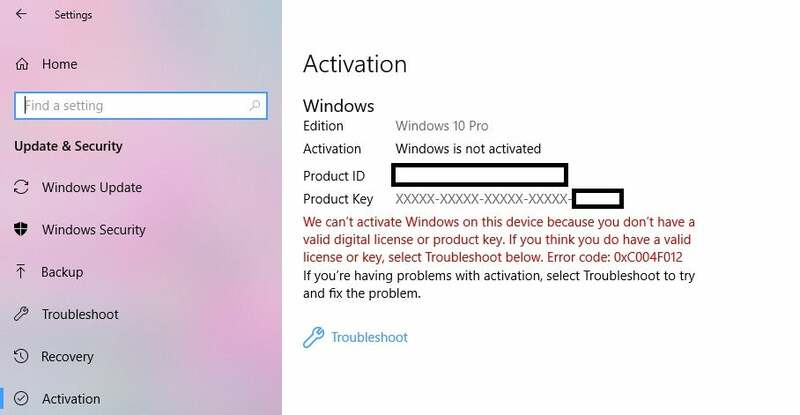 You may see this error message if Windows thinks that your copy of Windows 10 isn’t activated. Clicking the “troubleshooter” link at the bottom may help. Microsoft does seem to be working on the problem, though. If you go to Settings > Update & Security > Activation, you’ll see a blue Troubleshooter link at the bottom of the page. Click it, and Microsoft will attempt to discover the source of the problem. Fortunately, in my case, it worked—though there’s no guarantee you’ll have the same luck, unfortunately.